Software for all Audio needs, Supporting MP3, MP2,MP1, Ogg Vorbis and WMA play and decode. All programs run on Windows 95 / 98 / Me / NT / 2000 / XP / Vista. All programs now FREEWARE ! Dont use inferior methods of Ripping, using the ASPI layer is the best. ----> Features included in ASPI Rip <----- * ASPI layer CD Digital Audio Extraction (DAE) for quality Ripping (no pops, clicks). * MP3 (Fraunhofer) external Encoder support (ACM). * L.A.M.E. front end support for MP3 Variable bit rate or Constant bit rate Encoding. * Ogg Vorbis encoding. * GUI Encoder operation for exe's, no dos windows. * Run multiple instances of the program, one per CD drive for simultanious Ripping and Encoding. * Auto Encode multiple Recordings from any input with Recording Timer. * Auto normalization. (volume leveling feature). * Re-sample MP3 to MP3 to other bit rates (for down sampling to use low rates in hand held devices). * Choice of CD output sample rate from Ripper 44,100 hz or 22,050hz. * freedb agent CD info lookup for MP3 or Ogg Tagging and Re-naming from Internet. * freedb to cdplayer.ini batch lookup program. * Analog Rip included for a ripping alternative to ASPI. * Customisable Template "Tag to Filename" Re-Namer. * Re-Name with optional Letter Case (lower, UPPER, Norm). * Auto Create M3U Playlist file from MP3's. * Use CDplayer ini or Existing MP3 file for Tag info. * Tagging in ID3 retains Track position in MP3 or Ogg. * Imports CSV (MS Excel) and Tab delimited txt files into Tagger window. * ID3v1.2 tag provides double ID3v1.1 size with your own defined SubGenre. * Ogg Vorbis tagging. * Optional Wave Delete after Encoding. * Preview Wave Before Encoding or send to Audio Edit to Edit. * Right Click Windows support + Drag and Drop support. * Auto send to JukeBox Decoder for Playback, Listing or Tagging. * Detailed popup balloon Help tips on each control. * Toggle on or off File Associations and Desk top Icon. * No technical ripper settings required, fully automated speed, jitter and buffer adjustment with two simple error control modes. Splits wave files and sends to MP3 / Ogg encoder. Decode and split bad ALBW files that m3a extract wont unpack. Normalize wav before burning to CD, plus remove silence, add fades and other effects. ----> Features included in Audio Edit <----- * Open Wave or MP3 files to Edit. * Normalise a whole file or exclude silent sections to get a proper normalisation. * Record in various formats. * Edit Left, Right or Both channels. 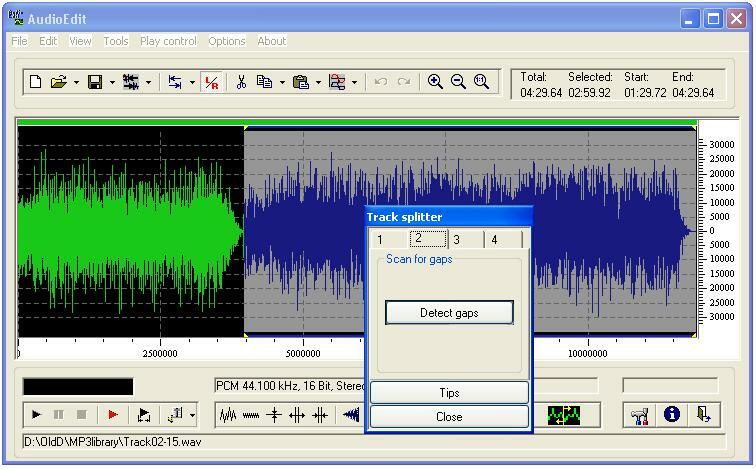 * LP Track File auto gap detecting chopper function to chop file into seperate files per Track. * Cut, copy, copy to clipboard, copy to new file, copy to multiple files. * Reverse, Invert, Paste, mix paste, paste from clipboard, convert to sample format. * Save to or Open MP3 to edit (req ACM Fraunhofer codec) * Fade in, fade out,Trim (tip and tail), pitch, echo. * Real time viewing during recording. * Customisable visual editor * Skins Included. 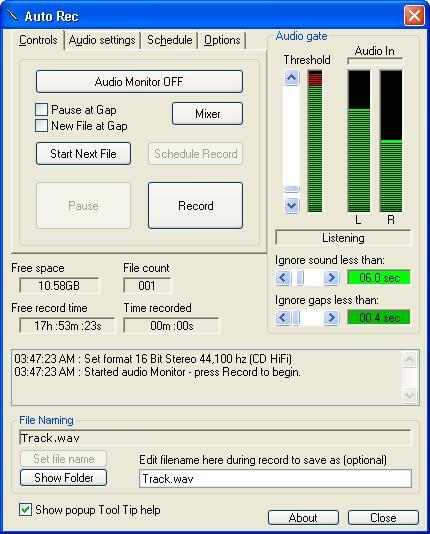 LP or cassette ripper, Automatically detects gaps during recording audio. Automatically record audio from LP records, cassettes, voice notes, radio or frequency scanner. Only the audio present is recorded. ----> Features included in AutoRec <----- * Vox sound activated audio recording gate. * Auto Create new file at gaps results in a file for each track of audio. * Auto Pause at gaps to que up next track for non sequential recordings.. * Full scheduling to automate start and or stop recording for any date and time. * Recorded files sent to MP3 or Ogg audio compression encoder. * Program logging of recording session. * Record in any Wav format. * Options to limit recording time to any one file and number of files. * Can monitor a frequency scanner only recording the incoming audio. * Great to que up tracks, recording only begins after audio input starts. * Adjustable audio noise floor can be set. * Adjustment for ignoring gaps less than set time or ignore audio shorter than a set time. * "No clip" buffer function ensures no audio is clipped or silence recorded. Decode MP3,2,1, Ogg Vorbis, WMA to Wave to burn to CD, use Audio Edit to join or edit Wave files. ----> Features included in JukeBox Decoder <----- * Drag and Drop files to Desk Icon or files or whole folders to Playlist Window. * Supports all MP3, MP2, MP1 Audio files, CBR and VBR. * Supports Ogg Vorbis Audio files, WMA Windows Media Audio files and Wav Audio files. * 1 octave 10 band equalizer 32hz to 16khz * Pitch Control (speed) Slider and Song position Slider. * Right Click files for Enque, Play, Open, Tag and Decode (MP3 to Wave) in Windows. * freedb agent CD info lookup for MP3,2,1 or Ogg Tagging and Re-naming from Internet. * freedb to cdplayer.ini batch lookup program. * Reads M3U/M3A (playlist and album) files, extracts album file contents. * M3A Album viewer / extractor only can be downloaded seperately (see below for m3aExtract) * Creates M3U/M3A (playlist album), HTML(webpage), CSV (MS Excel) and Tab delimited txt files. * Imports CSV (MS Excel) and Tab delimited txt files into Tagger window. * M3U/M3A album files can store all files inside one album file to play, no gaps. * Batch Decode MP3 or OGG to Wave files and Auto run CD burner all in one go. * Batch Re-Namer / Tagger with optional Letter Case (lower, UPPER, Norm) * Auto Fade + Fader speed In and Out control * Saves Playlist on closing JukeBox so each time you open Play begins. * Toggle on or off Windows File Associations (right click menus) and Desk top Icon. * Displays ID3v1, v1.1, v1.2, v2.x, Ogg and WMA Tags. * Supports ID3v1, v1.1, v1.2, v2.x, Ogg Vorbis Tagging. * Removes v1, v2 and OGG tags. * ID3v1.2 tagging provides double ID3v1.1 size with your own defined SubGenre. * Re-namer use templates or add your own to auto set file names and create folders from Tag info. * Playlist viewer shows Track Pos to sort to that order of Play. * Full Screen Playlist View with Right Click menu to remove, crop, invert. * "Skins" to add some color. * Loop, All or Random (shuffle) List Play options to Loop a whole list in order or Random. * Set or Drag column order and columns shown in the Play list including : File, Path, Title, Artist, Album, Genre, SubGenre, Year, Comment, Time, Track Pos, Sample Rate and Bit rate. * "Always on top" option. * Open more than one Player. * M.R.U. (most recently used) files list. * Global HotKey (operate player menu from a hot key you press from anywhere in windows). * Program context HotKeys for all functions (see general options). * Sys Tray control feature that minimises player next to your Clock with Right Click Menu to operate player, displays current and total play times as well as balloon tooltip with detailed tag and mp3 format info. Play and total time is displayed with status. To Download software, right click any file link below and choose "Save Target As", then choose a folder on your computer to download to. Unzip/Extract install EXE in the file and double click the EXE to install. Includes ASPI Rip, Audio Edit, Auto Rec and JukeBox Decoder plus utilities CD ini editor and Analog Rip. ASPI Rip ONLY Audio Edit, Auto Rec and JukeBox not included. ASPI Rip ONLY installer, is for those who already have Playback and Editing software installed and only require ASPI Rip. This is a viewer extractor for the m3a Album files created by JukeBox Decoder. It can also recover files from ALBW files including damaged ones as well as split any long tagged and joined mp3 files. The ID3v1.2 specification is HERE.